Outcome -based education (OBE) is an educational theory that bases each part of an educational system around goals (outcomes). By the end of the educational experience each student should have achieved the goal. The Educational Framework of the Guru Nanak Group of Colleges is centered on creating a student enabled environment in all its constituent educational institutions. Towards this end, the society is making concerted efforts to create a veritable infrastructure of learning that would catalyze the holistic development of the student at the Under Graduate level. The framework is so structured as to nurture innovative thinking amongst all students. The trust is wholly committed to providing an enriched environment of learning to all the students passing through its educational, Nursing & Medical institutions. The society reposes implicit faith in the potential of the students and has put in place a regimen to create or add value to the student by harnessing their talent through systemic training in terms of skill building, personality development, lateral thinking and career mapping. Identification and Enrichment of the innate talent of students – scholastic and otherwise – is the hallmark of the society’s ethos and constitute the key drivers to the realization of the requirements – both institutional and corporate – in congruence with what was envisioned by the founders of the society. In order to buttress its strengths and differentiators to stand out as the most preferred Educational Society, the society has set up centers of research and excellence such as the Clinical Labs, Pharmacy as well as Educational Labs. Such initiatives serve to hone the problem-solving skills of students. One of the main focus areas of the Guru Nanak Educational Charitable Society Regd is to make its students efficient in their profession like as a Doctor, Nurse and as a Teacher by creating an environment of resources and infrastructure to promote education amongst students. To make it ensure, teaching practices & clinical training are carried out as per the syllabus of the respective universities. Through these events students are given an opportunity to develop new thoughts relating to their fields. In light of this backdrop, the Guru Nanak Educational Charitable Society Regd is committed to nurture the students to be next generation leaders of the Medical & Education field. The society is of the compact conviction that the Health Care & Education Framework visualize cover all facets of the holistic development of students, who would contribute to the country’s growth as socially responsible citizens. At Guru Nanak Group of Colleges, we pay a lot of attention to student feedback and ensure that we take it at least twice every three. We acknowledge that students are the key stakeholders at Guru Nanak Group of Colleges and their personal satisfaction with the quality of education that they are receiving at Guru Nanak Group of Colleges must always be held supreme. 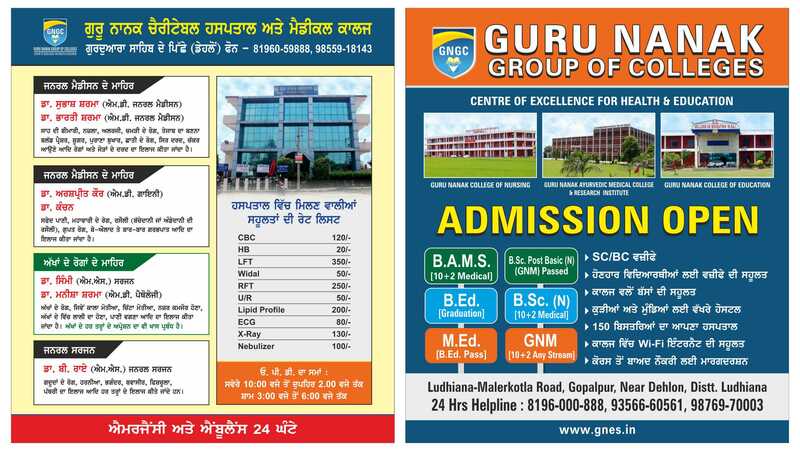 We welcome students and their parents’ beneficial suggestions for the improvement of our teaching methodologies, faculty-student interaction, the facilities they receive at Guru Nanak Group of College campus and hostel etc.